Structured settlements are backed by life insurance companies that are well established, customer-focused and may provide an additional layer of security at a time when physical injury claimants need it most. When personal injury clients choose a structured settlement, they can look forward to many years of steady, guaranteed income. But is a fixed-payment settlement enough? What about inflation? And the rising cost of living? Many investors still fondly remember the double-digit returns on securities they experienced in the late 1970’s and early 1980’s. Holding on to the past, they refrain from making financial commitments today on long-term obligations in hopes that rates will again rise to the levels of recent decades. But how realistic is this expectation? Learn about several financial issues including wealth accumulation and the benefits of a structured settlement consultant. A lawsuit settlement could be your one chance to protect your financial future. Learn how a payment stream can accomplish this and hear from those who are seeing the benefits. This four-page publication contains reflections about civil rights and structured settlements from U.S. Congressman John Lewis, the sole surviving speaker from the 1963 March. In addition to his courageous civil rights work, Mr. Lewis is a longtime proponent of structured settlements and the rights of accident survivors to accept claim settlements in a stream of tax-free income. At the core of the federal tax code’s explicit recognition of structured settlements is the concept of constructive receipt. This handout includes citations, for the doctrine of constructive receipt and offers a concise explanation about Congress’ intent and how the Internal Revenue Service has traditionally interpreted its application. This helps explain the how people in their 20s and 30s can design future payments to take advantage of the federal tax rules that make structured settlements so financially attractive. A structured settlement is an ideal way for people in their middle years to handle the increasing financial burdens of children, college, parents and retirement planning. As people near retirement age, their notions of financial risk change considerably. 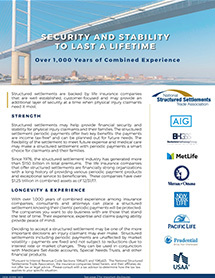 Find out about structured settlements’ unique financial and security benefits and how these can be especially valuable for those who are in or nearing retirement. 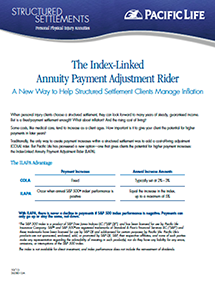 Find out why a structured settlement annuity is one of the safest possible ways to protect future income. Injured children are at special risk from others taking financial advantage of them. A structured settlement not only protects their settlements, it can help settle their claims faster. With as little as $2,000 in assets, you can be disqualified from some government support programs. But a special needs trust funded with a structured settlement can help maintain your eligibility. 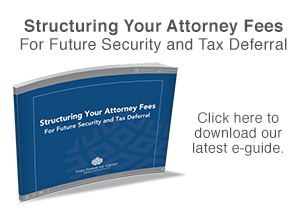 The federal tax code encourages structured settlements for workers’ compensation claims. Find out more about how this option can provide steady tax-free income for a worker and that worker’s family. 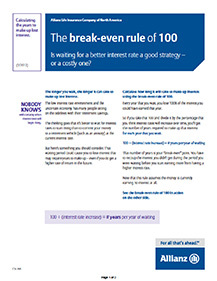 Is waiting for a better interest rate a good strategy – or a costly one? The longer you wait, the longer it can take to make up lost interest. Calculate how long it will take to make up interest using the break-even rule of 100. 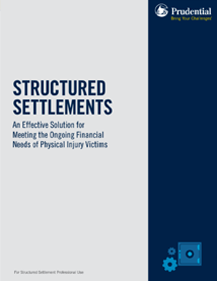 Structured settlements have played a role in helping physical injury victims and their families for more than a quarter century. 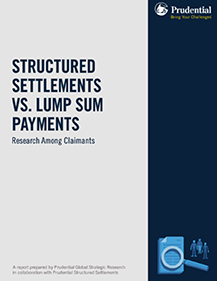 In 2013, Prudential Global Strategic Research — in conjunction with Prudential Structured Settlements — surveyed 400 claimants who, within the past decade, had entered into a settlement of a physical injury or workers’ compensation claim of at least $100,000.